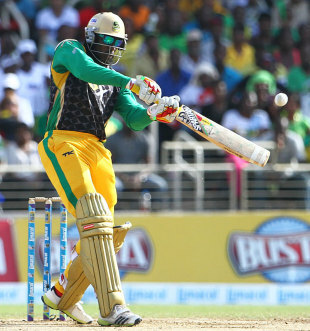 Chris Gayle's all-round efforts helped Jamaica Tallawahs to a three-wicket victory over Trinidad & Tobago Red Steel and secured their position as second in the group, tied on 10 points with Guyana Amazon Warriors. Red Steel will play Guyana Amazon Warriors in the first semi-final on August 22, while Tallawahs will play Barbados Tridents in the second semi-final on August 23. Red Steel were put into bat, but were unable to build significant partnerships through the disciplined bowling and fielding performance of the Tallawahs. David Bernard and Andrew Richardson were miserly with the new ball upfront, while Gayle chipped in with 2 for 24. There were three run outs effected in the first innings, with only Ross Taylor, Darren Bravo and Dwayne Bravo being able to score 20 or more. Red Steel eventually finished on 133 for 8 at the end of their 20 overs. Tallawahs started more assuredly in their innings, with Gayle and Chadwick Walton putting on 66 in just under seven overs. Gayle smashed 51 of those runs, off just 25 balls which included five sixes. Tallawahs were well on their way to the target, but lost four wickets in the space of 23 balls to even up the contest. However, Danza Hyatt anchored the innings with his run-a-ball 25 to see Tallawahs home on the last ball of the innings, and with three wickets in hand.